One of my intentions that I try to include in my day to day life is to be more mindful, especially when it comes to my own and others holistic health. So here’s what has been playing on my mind this morning. Where have our clothes come from? Who made them? How much were they paid to make them? What chemicals have been used to dye them? What happens when we throw them away? This is a topic that I am starting to think about more and more so it was only fitting that I wanted to find out more about Chloe and Sarah and their ethical clothing line, Zeenya! 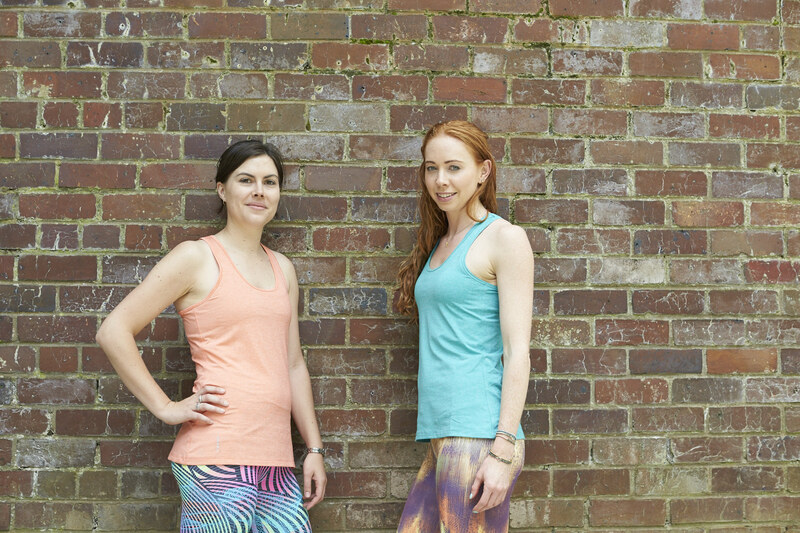 These two gorgeous Goal Diggers are following their passions, radiate authenticity by living true to their values and are embracing life through colour with their stunning activewear range. Dig in, this one’s a goodie!! Also keep your eye’s peeled over on GDNZ Facebook and Instagram for a chance to win a $50 voucher to spend on your own Zeenya Clothing! We’re active, fun loving and energetic women who, like many women out there today, continue to seek the balance between work, life and relationships. For us, that means spending time outdoors with good friends and family, enjoying the beautiful country that we’re so grateful to live in. We’ve been friends for nearly 5 years after working together at Sport Waikato. While we live in separate cities (Chloe in Tauranga and Sarah in Auckland) we talk via text or phone pretty much every day. Our friendship has been an important foundation for our company. For Zeenya we wanted to create an ethical fitness clothing company which supports small business in an overseas country. We wanted to be part of the conscious consumer movement where we know our supply chain. We love bringing unique and vibrant clothing to New Zealand. None of our clothing is mass produced so once a print goes, it’s gone for good. S: Have recently learnt to let go of things and delegate. This has allowed me to gain back my work/life balance in favour for more life and less work. C: Realised more of my potential on how I can positively influence the people around me just by being myself. I’ve taken up temping to help myself financially after almost a year off full-time work; by being positive, helpful and proactive I’ve come to understand how much the attitude of one person can lift the people around them. When we travelled to Brazil together in 2013 we were blown away by Brazilian women’s sense of self and love for their bodies. 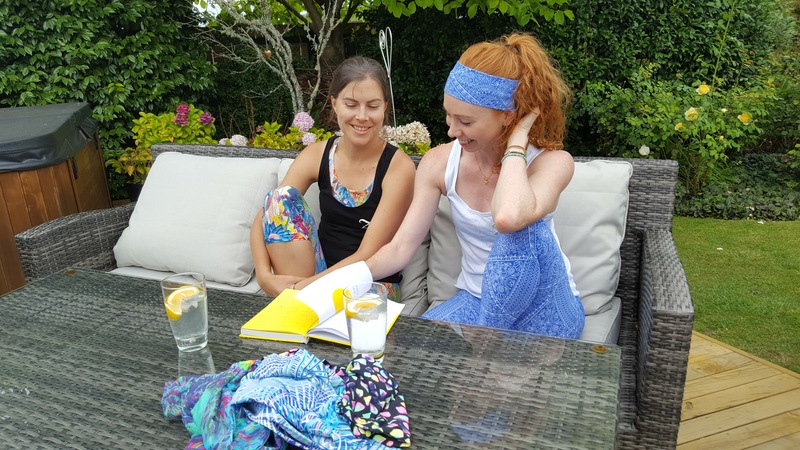 Sarah fell in love with the bright printed activewear and brought lots home with her. At the time NZ sold black with a shade of black and people loved her leggings. We recognised the opportunity and while we could have just brought product in for our friends, we decided to go the whole way and do it professionally and share colour with women from all over the country. Our vision is Embracing Life Through Colour, which means women of all shapes and sizes feeling good about themselves and their bodies. We want to empower women to ditch black clothing as a way of ‘hiding’ when we exercise and get into celebrating more of who they are already. For us the colour helps lift moods and bring a little fun into working out, we think all of us deserve more fun and happiness. We want to be the choice for conscious consumerism, not all activewear is created equally, we know who makes our product and the conditions in which they work. We’re fortunate to have access to great biodegradable fabrics from a supplier who is proactive in reducing the environmental impact of the textile industry. Really establishing ourselves as a conscious consumer option for people wanting to know more about where their clothing comes from. Our aim is to continue to provide product which is eco-friendly and produced in a sustainable way – for more info on where and how our product is made you can read about it here. S: When I didn’t believe in myself. Self-doubt at times has stalled my ambitions. I’m proud of where I’m at today, and reflection is what helps me to move past these stages of self doubt. I know there are things I want to achieve especially in terms of my career it is a matter of believing I can and will do it. C: I put everyone else above myself. In my previous jobs I’d felt like saying no to someone else took away an opportunity for them to share in the love I have for sport. Eventually I realised how important it was for me to participate in what I loved doing and so learnt to say no in order to feel good. In December we co-hosted a collaborative event with a group of epic like-minded women bringing wellness and fun to a hectic and often stressful time of year. 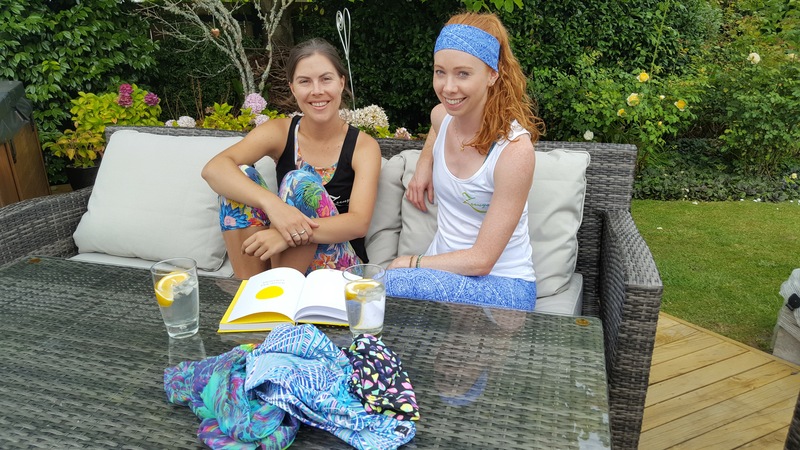 For us it was a huge success with people coming from all around the Mount area to take time for themselves to do yoga and take surf/paddle board lessons. We celebrated with red wine. Always. If you’ve ever wondered how our prints get named, blame it on the red wine. Everything in moderation. S: Feeling in control of my own destiny. C: Feeling like I don’t have to answer to anyone but myself. S: I’m so not a risk taker! C: Last year I quit my job and volunteered at Rio 2016, I kissed goodbye to everything familiar (routine, friends and locations) and I plan to continue living my life in face of the unknown. S: I stalk Chloe, actually I ring her, she is the best sounding board of positivity. C: Tim Ferriss – his podcast with interviews with people from all walks of life who are world class lifts and inspires me to keep going. @timferriss am also starting to read his new book Tools of Titans, great influencers under the headings of Healthy, Wealthy and Wise. C: Running, I’m still searching for my running mojo, lost mid 2016… if found please return. 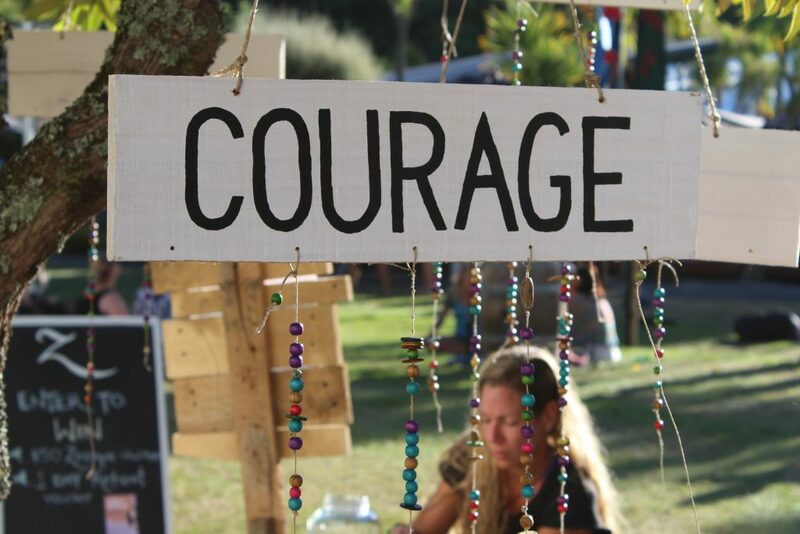 S: Nourishing my body by preparing real fresh food, moving often through yoga, swimming and running in nature. also getting my dose of the ocean to make me feel alive. C: Spending time by myself in the outdoors and taking time to check in with how I’m feeling about things. S: I start with a swim at 6am before heading into the office grabbing a coffee, and eating my homemade granola with yoghurt out of my favourite glass jar 🙂 I am currently working full time for Surf Life Saving Northern Region as the Community Education Manager therefore I am either based in the office replying to emails, doing admin tasks, or over the summer out and about at the beaches checking in on my staff and the programmes they are running. After work I like to attend a yoga class where possible or get into the ocean for another swim. Food is an important part of my day and I love cooking healthy and delicious meals when I get home in the evening. I’ll then take time to catch up on any Zeenya work that Chloe’s sent me throughout the day. C: I really don’t have a typical day. I spend time working out my priorities in the morning then plan my day accordingly. I spend more time doing the things I love most and the least amount of time on things I don’t like (e.g. emails or phone calls). I then work when I feel like it and work best with tight timeframes. Always making time for catch ups with Sarah and updating her on the big things for Zeenya.